The first Dead Drop contract at Hero Hill, to stop a necromancer from achieving immortality. Retrieve your first dead drop from a hollow rock on Hero Hill. Learn of the lich's weakness, and decide how you will deal with Celedaen. Head to the next dead drop under the Great Oak in Chorrol. This is your first contract as a Silencer of the Black Hand and is initiated by "The Dead Drop" mini-quest, which requires you to travel to Hero Hill to find your orders. Your target is Celedaen, a necromancer in Leafrot Cave who is trying to gain favor with the great Sovereign by attaining lichdom. Once you get inside, you will come upon a few leveled undead near a bedroll, with some alchemical equipment, a chest, and various books - make sure you look for the Destruction skill book, The Art of War Magic. On the table is Celedaen's journal, The Path of Transcendence, which tells of his quest for becoming one of the undead, specifically, one of the Worm Eremites. According to the journal, the fabled way of killing liches by shattering their Soul Container at any time is actually a myth. The only way to truly kill a lich is to, during the transformation, remove their Soul Container from their physical person while it is being used to transport their soul from their mortal body. Luckily, his transformation is not yet complete, leaving that weakness open for exploitation. This gives you two options: simply fight this powerful mage, or sneak up on him and pickpocket his Soul Container: the Sands of Resolve (looks like an hourglass). If you steal the hourglass, he will die instantly, and you will simply need to go to the next Dead Drop in Chorrol to complete this quest. Celedaen's journal makes reference to Falcar, whom you may remember from the Cheydinhal Recommendation quest, if you are in the Mages Guild. It seems that Falcar is a highly regarded necromancer who has not been willing to comply with Traven's new anti-necromancy policies. This quest was intended to give 1 Infamy point upon completion, but the result script for the final stage uses the improper command player.modav infamy 1. It should be modpcinfamy 1 to have the correct, desired effect. As a result, your infamy stat in the accomplishments page is not incremented. 10 According to Lucien Lachance, I will now receive my contracts, as well as any rewards I may be owed, by visiting secret dead drop locations scattered around Cyrodiil. My next contract can be found in a hidden hollow inside the moss-covered rock on the top of Hero Hill, which is to the southeast of Fort Farragut. 100 Finishes quest I have visited my first dead drop location and received my next contract. 10 I have received my new orders from Lucien Lachance. I must go to Leafrot Cave and kill a Necromancer who has begun the process of transforming himself into a lich. This Necromancer, Celedaen, has not yet completed his metamorphosis but is still incredibly powerful -- possibly too powerful to kill if faced directly. 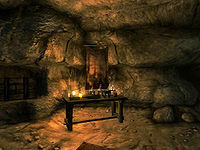 I should search the cave for Celedaen's writings, and try to discover his weakness. 20 I have discovered the journal of the Necromancer Celedaen. It appears he has used a magic hourglass called the Sands of Resolve to turn himself into a lich and extend his life indefinitely. The process is not yet complete, however, and the hourglass must remain on Celedaen's person for some time, as it contains his life force. If I could remove the Sands of Resolve from Celedaen's posession [sic], perhaps through pickpocketing, he would surely die. 30 Celedaen is dead. I must pick up my reward and next contract at the dead drop located in an old sack hidden in the bushes beneath the Great Oak, in the city of Chorrol. It is possible to use the console to advance through the quest by entering setstage Dark10SpecialWizard stage, where stage is the number of the stage you wish to complete. It is not possible to un-complete (i.e. go back) quest stages. See SetStage for more information. Esta página foi modificada pela última vez à(s) 13h38min de 16 de dezembro de 2014.